This volume examines advanced research results, technological development and applications of modelling and simulation. It provides a comprehensive overview defence modelling and simulation, advancements in computer generated forces and agent-based modelling and simulation, approaches to simulation reuse and interoperability, and applications in defence and information assurance. The "Monitor" section provides information on applicable M&S standards; simulation systems and software, selected publications and other information sources. Editorial. "Advances in Modelling and Simulation." Information & Security: An International Journal 12, no. 1 (2003): 5-15. Niemeyer, Klaus. "Modeling and Simulation in Defense." Information & Security: An International Journal 12, no. 1 (2003): 19-42. Ćosić, Krešimir, Miroslav Slamić, and Dražen Penzar. "Combat & Security Related Modeling and Simulation in Croatia." Information & Security: An International Journal 12, no. 1 (2003): 43-60. Petty, Mikel. "Benefits and Consequences of Automated Learning in Computer Generated Forces Systems." Information & Security: An International Journal 12, no. 1 (2003): 63-74. McKenzie, Frederic, Mikel Petty, and Jean Catanzaro. "An Experimental Application of a Trait-Based Personality Model to the Simulation of Military Decision-Making." Information & Security: An International Journal 12, no. 1 (2003): 75-92. Kirov, Georgi. "Soft Computing Agents for Dynamic Routing." Information & Security: An International Journal 12, no. 1 (2003): 104-116. Parr, Shawn. "A Visual Tool to Simplify the Building of Distributed Simulations Using HLA." Information & Security: An International Journal 12, no. 2 (2003): 151-163. Tolk, Andreas. "Common Data Administration, Data Management, and Data Alignment as a Necessary Requirement for Coupling C4ISR Systems and M&S Systems." Information & Security: An International Journal 12, no. 2 (2003): 164-174. Roland, Ronald. "A Small Step toward Interoperability." Information & Security: An International Journal 12, no. 2 (2003): 175-192. Georgiev, George, and Valentine Penev. "Mathematical Model of Fuzzy Control System for Autonomous Guided Vehicle in 3D Space." Information & Security: An International Journal 12, no. 2 (2003): 195-207. Karakaneva, Juliana. "Game Theoretical Modeling for Planning and Decision-Making." 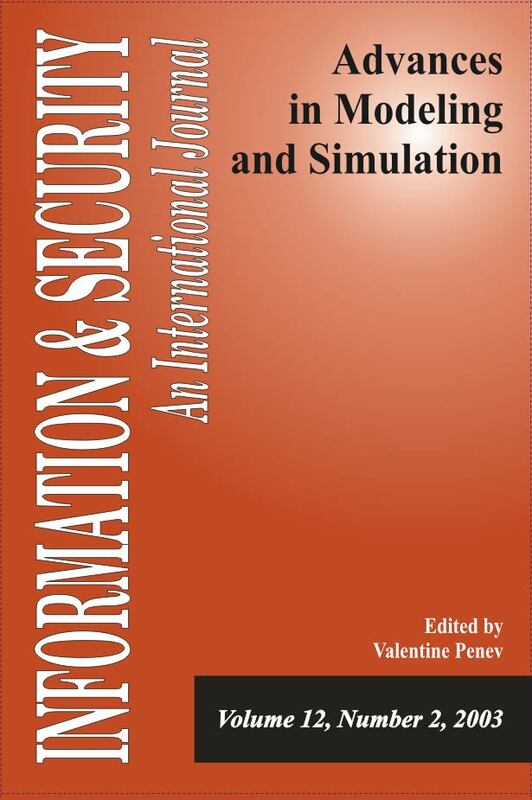 Information & Security: An International Journal 12, no. 2 (2003): 208-224. Hristov, Hristo. "Modeling in Shaped Charge Design." Information & Security: An International Journal 12, no. 2 (2003): 225-231. Monitor, ISIJ. "Applicable Modeling and Simulation Standards; Simulation Systems and Software; Selected Publications; Related Journals, Conferences, Workshops and Courses." Information & Security: An International Journal 12, no. 1 (2003): 119-134. Monitor, ISIJ. "Modeling and Simulation Internet Sources." Information & Security: An International Journal 12, no. 2 (2003): 261-275.